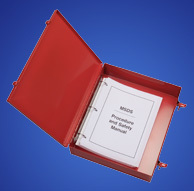 American Metal Crafters now offers steel 3-ring binder boxes. Fashioned from sturdy 22 gauge steel, our binder boxes provide accessible storage and protection for all your important documents. They are ideal for MSDS sheets, instruction manuals and procedures. These attractive powder-coated boxes are easily mounted on machinery, cabinets, equipment and walls. 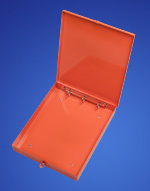 Steel binder boxes are available with or without 3-ring spline. Custom sizes are available in quantity.